Welcome to the most comprehensive Web page about one of the finest actresses of the world: Juliette Binoche. If you don't know her, she is the star of Kryzstof Kieslowski's "Three Colours: Blue", and has also appeared in films such as "Damage" or "The unbereable lightness of being". In all of them, she has showed her great acting talent as well as her elegance and beauty, and if you became a fan watching these films, you'll find a lot of interesting information (hopefully increasing with your help) here. STANDARD DISCLAIMER:Resources archived locally or remotely may be subject to copyright laws. I've used these materials without permission. If someone complains, I'll remove them until I get permission. Obviously I'm not putting this page together for profit, nor to deny anyone their due. I urge everyone to go out and buy the originals whenever possible. The author of these pages is me, Paulo Jan. I have designed them with Netscape 1.1 and a TrueColor display in mind, but you should be able to view them decently too with NCSA Mosaic 2.0 for Windows. I think that this covers the 80% of the users, but if you are not among them, don't flame me!! Just let me know (though I probably won't be able to do anything about it anyway). Thanks to the Paris neighborhood of GeoCities for hosting this page. A mention also to WebCounter for logging the accesses to this page. OK, enough of introductions and legal stuff. Here is where the real page starts! NOTE: if you are looking for the links for the filmography or the interviews, just scroll to skip this table. For the moment these sections are in this page; later, if I can find more info, I'll move them to separate ones. "Dorothée, danseuse de corde" (TV) (1982). "Le meilleur de la vie" (1984). "La vie de familie" (1985). "Je vous salue Marie" (1985). "Mon beau-frére a fue ma soeur" (1986). "The unbereable lightness of being" (1987). "Un tour de manége" (1987). "Les amants du Pont-Neuf" (1991). "Mara (Women and Men)" (TV) (1991). "Le hussard sur le toit" ("The horseman on the roof") (1995). "A couch in New York" (1996). SPECIAL THANKS TO: Steve and Jeremy Henderson. Fotogramas (Spain), May 1993 (interview). Sight and Sound, September 1993 (personal profile and career review). Daily Telegraph (Sunday suplement), 7th December 1995 (personal profile and interview). Stern (Germany), 26th February 1996 (short profile). If after the above your still think that this page is incomplete, and that it lacks information about lots of aspects of Juliette Binoche's career, work, life, etc... well, then you must be a real fan of her -even more than me. Why don't you help, then? Just mail me with any information that you have: pictures, interviews, biographies, etc. Even if you don't have, I'd like to hear your feedback, too. Some people has already contributed (in one or other way) to this page. Read about them and have a look to their pages! (Some of them are really better than this one). 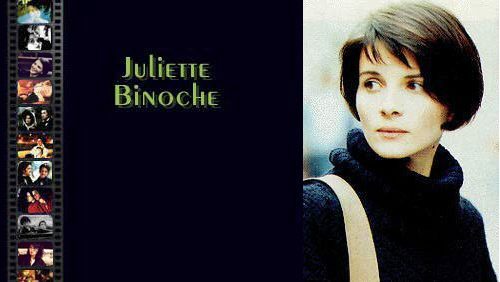 You can also have a look to some of the other Juliette Binoche sites that have appeared in the last months. Hope you enjoyed. See you soon. Return now to Paris Geocities.